No one in the Strange Music world is more excited about the signing of ¡MayDay! than Tech N9ne. Tech was responsible for bringing in the Miami based band, known for their mix of hip hop and alternative rock. All of the hype surrounding the new addition to Strange had Tech taking his excitement to Twitter. 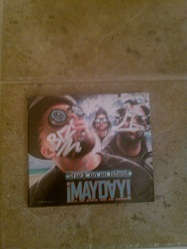 Tech shared photos of an autographed copy of ¡MayDay!’s Stuck On An Island, their latest album. Fans will get to share in Tech’s enthusiasm when they catch ¡MayDay! live on the All 6’s And 7’s Tour this summer. Click here to follow Tech N9ne on his official Twitter page.